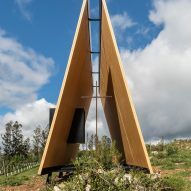 Architecture studio MAPA has designed this simple prefabricated wooden chapel for a vineyard in Maldonado, Uruguay, puncturing a black box through one of its slanted walls to provide a shrine for the patron saint of winemakers. The prefabricated open-air chapel is located in the 101-hectare Sacromonte vineyard, which forms part of The Sacromonte Landscape Hotel in Pueblo Edén. Brazilian and Uruguayan studio MAPA previously designed 13 guest suites for the property. For the Sacromonte Chapel, components made in a factory in Portugal were sent to the rural setting, where they were put together in 24 hours. The structure comprises a pair of slanted walls made of cross-laminated timber – an engineered wood with a strength to rival steel and concrete. Measuring six by nine metres, the walls lean towards each other to rest on a black steel frame at the top, with a narrow gap left between them. "Simple and austere, its design assumes the challenge of conveying a powerful message using the lowest amount of resources possible," said MAPA in a statement. The black metal box slotted through a hole in one of the walls forms a cabinet for the Virgin of La Carrodilla, who is celebrated as one of the most well-known patron saints of vineyards. Translucent onyx covers the back of the volume to left natural light filter in. Other parts that make up Sacromonte Chapel are a gridded metal floor, and a pair of long struts that raise it above the uneven ground. There are no walls on the shorter sides, so the interior is left exposed to the elements. "Neither closed nor completely open, it is a space in itself but it is part of its environment at the same time," said the studio. 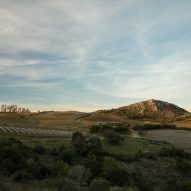 "Inside, the planes try to protect and sanctify a small portion of the landscape but respectfully deny its confinement. Thus, the concepts of interior and exterior are diluted in a diffuse and ambiguous spatial experience." Sacromonte Chapel forms part of a number of inventive, small religious sanctuaries. 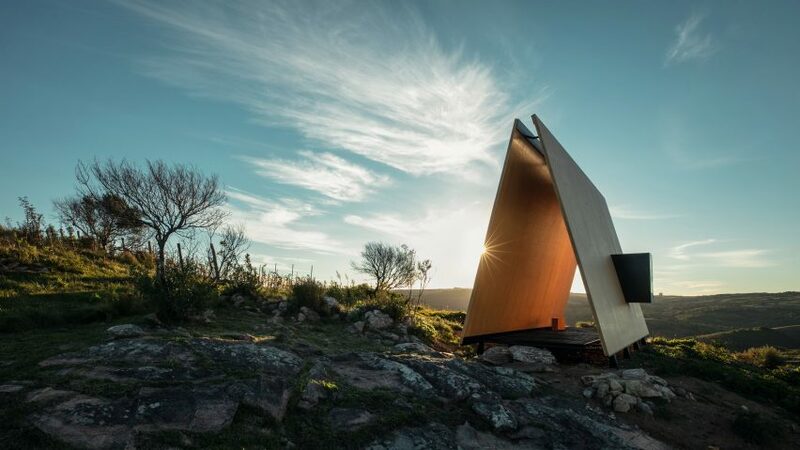 Plano Humano Arquitectos recently completed a similarly open-air chapel in Portugal, while Innauer-Matt Architekten designed a tiny Alpine chapel that features a steep shingle-clad roof. Pritzker Prize-winning architect Álvaro Siza also created a larger chapel for an off-grid retreat in the Algarve. Along with the chapel and guest suites, MAPA was enlisted to design a variety of projects for The Sacromonte Landscape Hotel. 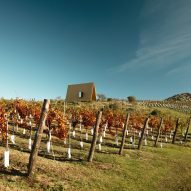 It has already completed three kaleidoscopes for observing the landscape and a large table for hosting up to 50 people. "We call the whole set of them 'landscape amplifiers'," MAPA's Sebastián Lambert told Dezeen. "All of them were prefabricated in cross-laminated timber wood and transported directly from the factory in Portugal to the landscape." 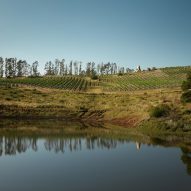 "The landscape amplifiers arrive to be activated by programmes for the enjoyment of wine, culture and art," he added. 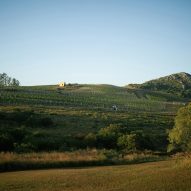 MAPA is currently working on a winery, a reception, a dining area and nine shelters for the vast site. It is likely that these will also be prefabricated, as the studio commonly uses the method to build quickly and cheaply. In 2009, the firm launched its own prefabricated building company Minimod as a more product-focussed arm, and has produced prefab houses in Uruguay and Brazil. Photography is by Tali Kimelman, unless stated otherwise.